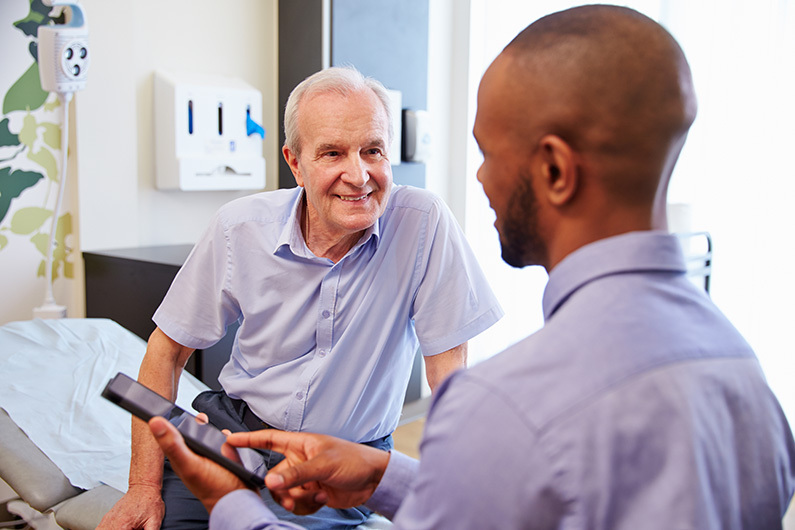 The prostate cancer treatment that’s right for you depends mainly on your age, the grade of the tumor (the Gleason score), the number of biopsy tissue samples that contain cancer cells, the stage of the cancer, your symptoms, and your general health. Your doctor can describe your treatment choices, the expected results of each, and the possible side effects. You and your doctor can work together to develop a treatment plan that meets your medical and personal needs. Radiation therapy is an option for men with any stage of prostate cancer. Men with early-stage prostate cancer may choose radiation therapy instead of surgery. It also may be used after surgery to destroy any cancer cells that remain in the area. In later stages of prostate cancer, radiation treatment may be used to help relieve pain. Internal radiation (implant radiation or brachytherapy): The radiation comes from radioactive material usually contained in very small implants called seeds (Low Dose Rate, Permanent Interstitial Prostate Seed Implant). Dozens of seeds are placed inside needles, and the needles are inserted into the prostate. The needles are removed, leaving the seeds behind. The seeds give off radiation for months. They don’t need to be removed once the radiation is gone. Both internal and external radiation can cause impotence. You can talk to your doctor about ways to help cope with this side effect. TURP: A man with advanced prostate cancer may choose TURP(transurethral resection of the prostate) to relieve symptoms. The surgeon inserts a long, thin scope through the urethra. A cutting tool at the end of the scope removes tissue from the inside of the prostate.TURP may not remove all of the cancer, but it can remove tissue that blocks the flow of urine. Surgery can damage the nerves around the prostate. Damaging these nerves can make a man impotent (unable to have an erection). In some cases, your surgeon can protect the nerves that control erection. But if you have a large tumor or a tumor that’s very close to the nerves, surgery may cause impotence. Impotence can be permanent. You can talk to your doctor about medicine and other ways to help manage the sexual side effects of cancer treatment. At the present time, ASTRO believes the comparative efficacy evidence of proton beam therapy with other prostate cancer treatments is still being developed, and thus the role of proton beam therapy for localized prostate cancer within the current availability of treatment options remains unclear. While proton beam therapy is not a new technology, its use in the treatment of prostate cancer is evolving. ASTRO strongly supports allowing for coverage with evidence development for patients treated on clinical trials or within prospective registries. ASTRO believes that collecting data in these settings is essential to informing consensus on the role of proton therapy for prostate cancer, especially insofar as it is important to understand how the effectiveness of proton therapy compares to other radiation therapy modalities such as IMRT and brachytherapy.